Para leer esta historia en espanol, haga clic aqui, y haga clic aqui para recursos para votantes. New Hampshire’s Latino population is small, just around 4 percent. Still, in some areas, Spanish-speaking communities have grown steadily in recent years. In Nashua, many Latino voters are looking forward to participating in next week’s midterms. But some are finding it a challenge to get the information they need. Miosotis Cora likes to talk about politics, especially from her time working the 2016 campaign trail for one of Puerto Rico’s gubernatorial candidates. She shows me photos, as she scrolls through one of her Facebook albums: Here’s one at the governor’s mansion, and there’s the governor. 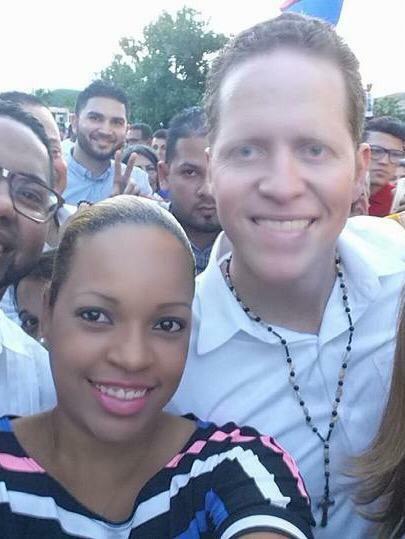 Miosotis Cora with one of Puerto Rico's gubernatorial candidate David Bernier in 2016. Since she’s moved to New Hampshire, she’s now eligible to vote in US elections, and she’s excited. "Tenemos el derecho ahora. Hay que aprovechar," Miosotis said. She says she wants to take full advantage of her right to vote. Her brother, Jose agrees. He moved here after Hurricane Maria. "Aunque tu puedes quejarte y eso, pero si tu no votas, ellos menos te van hacer caso," he said. You can complain, he says, but if you don’t vote, politicians will pay even less attention to you. But both Jose and Miosotis say they’ve had trouble knowing where to start: how to register to vote, where polling places are, who the candidates are and what they think about the issues. "Eso es lo que pasa aqui, como los hispanos nos tienen echados. no nos dejan escuchar." There’s not much information out there for hispanics, no one who’s really listening to us, Jose says. 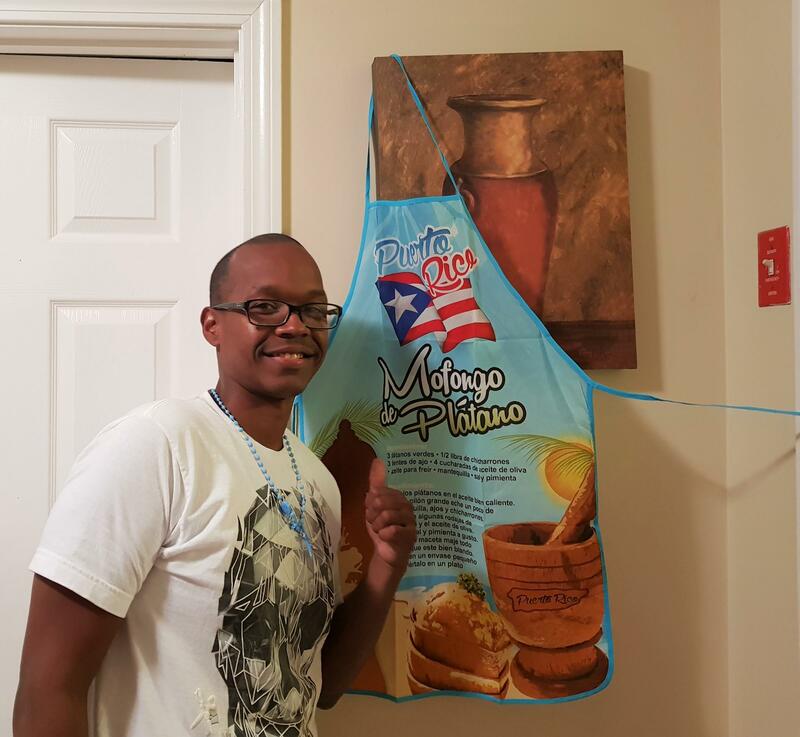 Jose Cora next to an apron with a Puerto Rican recipe. In each room of his apartment, there's a Puerto Rican flag. Driving around Nashua, you can see the city’s Latino population is growing. There’s a Mexican bakery,a Puerto Rican bodega, two Colombian restaurants and Spanish on many storefronts. According to the Pew Research Center, New Hampshire has nearly 30,000 eligible Latino voters. But, voter registration, ballots, information on the secretary of state’s website...that’s all in English. And only in English. David Scanlan is New Hampshire’s deputy secretary of state. He says states are obligated to provide voting materials in different languages. This is outlined in the federal Voting Rights Act. If a voting jurisdiction has a single language group of more than 10,000 people or more than 5 percent of the voting population, and the illiteracy rate of the rate of those citizens is higher than the national illiteracy rate, then all election information has to be available in that language. According to the state, no New Hampshire counties or cities have met that thresholds. And so far, Scanlan says, this hasn’t been a problem. "We do not receive calls about individuals that are having issues with an English ballot as opposed to having a different language on the ballot that might assist them through that process." Scanlan says that if someone does have an issue, they can ask the moderator at the polling place if they can get assistance to fill out their ballot. Some of Nashua’s election officials at polling places are bilingual. But for a lot of Spanish speakers, learning to vote means you have to know someone who’s in the know, like Martha Cecilia Alvarado. She's from Colombia and volunteers in the community and with the Granite State Organizing Project. Alvarado’s lived in Nashua since 2010, and she’s learning English. This election season, she’s helped about 10 people register to vote. Abraham Sanchez and his wife, Maria, listen to Julian Castro speak at Nashua's Casa Mezcal on Wednesday, Oct. 28. 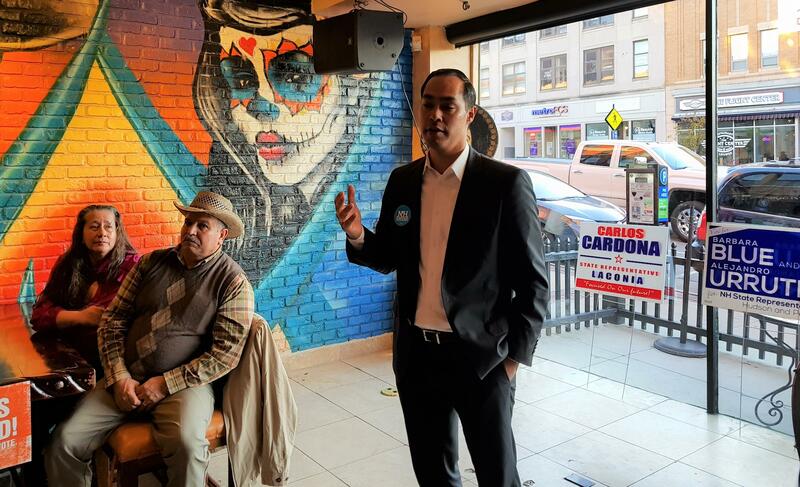 A couple of weeks ago, at an event put on by the New Hampshire Democratic Latino Caucus, Alvarado helped Abraham Sanchez understand what he’ll see on his ballot: the candidates and two proposed amendments to the state constitution. Sanchez recently became a new US citizen. “Yo ya estoy 'ready to vote' como dice el mexicano,” he laughs. For him these midterms are about change. "Pues los cambios es lo que ver que tengamos voto y tengamos poder, y tambien que nos decidiamos y no nos dejemos humillar." He says he wants to see more Latinos have a say in what happens, to have power. One of the candidates in Sanchez’s ward has been reaching out to Latinos. Democrat Manny Espitia is running for state rep in Nashua’s fourth ward. And he’s been doing a lot of his campaigning in Spanish. He says that the Latino community needs someone who can represent their concerns around education, healthcare, and immigration. For the first time, he’s helped put out an ad on social media for the Nashua Democratic City Committee, aimed at Spanish-speaking voters. There’s a link to polling places and a list of all the Democratic candidates. “I think it’s just keep working, keep working it and keep talking to people. Build it up,” Espitia says. For this election, Espitia hoping his efforts might get more Latinos in his community out to vote. But without election information in Spanish from the state, it's the political parties who provide it. The midterm elections are just a few days away. New Hampshire voters will be choosing who they want for governor, both congressional districts and in all 424 legislative seats. But with all the Democratic presidential hopefuls in town lately, it's starting to feel more like 2020 than 2018.